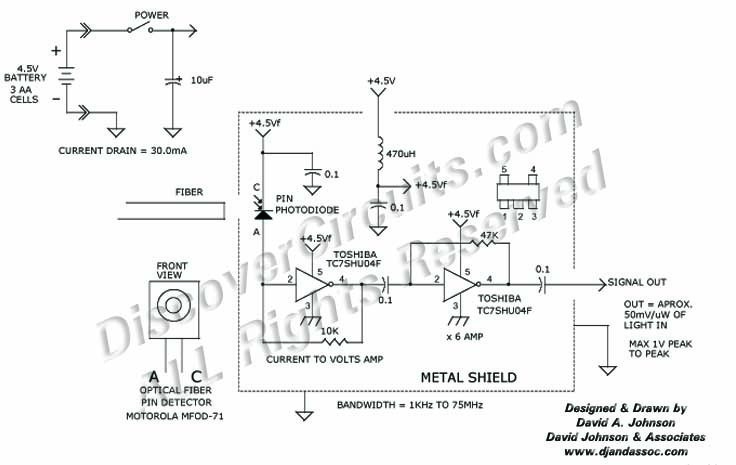 Circuit: Light Receiver works from 1KHz to over 70MHz __ Circuit designed by David A. Johnson, P.E. This circuit uses one tiny C-MOS inverter IC to form a modulated light receiver with a very fast response. It is designed around a PIN photo diode that is packaged for use with plastic optical fibers. It can be used as an optical fiber receiver. By using the open end of the optical fiber it can "sniff" out any modulated light signals.